Defending champion Victoria Azarenka overcame injury problems to end Sloane Stephens' Australian Open run and set up a final with China's Li Na. Azarenka left the court for almost 10 minutes to have treatment for what appeared to be stress after the American had saved five match points. But the Belarusian, who hurt her left ankle earlier in the set, broke in the next game to win 6-1 6-4. Sixth seed Li thrashed Maria Sharapova 6-2 6-2 in the first semi-final. Azarenka admitted that nerves had got the better of her on a swelteringly hot day when the on-court temperature soared past 40C. 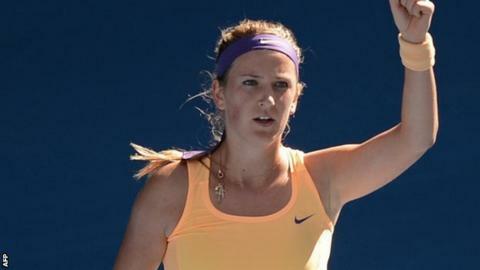 "I almost did the choke of the year right now," said Azarenka. "At 5-3 having so many chances, couldn't close it out but I'm glad I could close it out. Nerves got into me for sure." But she downplayed the controversial timeout, saying she needed medical treatment for a breathing problem. The top seed secured the first set in 28 minutes against the 19-year-old, who had caused the biggest upset of the tournament by beating an injury-hit Serena Williams on Wednesday. But the world number one hurt her ankle in the third game of the second set, allowing Stephens the chance to get back into the match. The champion seemed to have overcome the injury but mistakes crept into her game and she struggled to contain her frustration. However, Azarenka served for the match at 5-3 only for Stephens to save five match points and break serve. Azarenka then called for the trainer and went off for treatment, but came back to break the American straight away to clinch her place in Saturday's final. Stephens said: "It's happened before. I mean, I've had it in the last match, the match before, medical breaks, go to the bathroom, the whole showdown. "It was just something else, but it didn't affect anything, I don't think." Second seed Sharapova had only dropped nine games in her previous five matches but struggled with her serve throughout her semi-final against 2011 runner-up Li. Li Na very definitely makes the dinner plans for her team in Melbourne - "I always take them to Chinese food. Doesn't matter they want or didn't want. I say, 'Tonight we go Chinese restaurant.' They say, 'OK.' First two times, they was so excited. After third time, they say, 'OK....'"
The defeated Maria Sharapova doesn't quite know where is next for her. "That's a good question. I think it's Doha or maybe Dubai. I think Doha. I don't know. I'm so clueless." Sloane Stephens on Victoria Azarenka's breathing problems - "If it was one of my friends, I would say, 'Oh, my God, that sounds like a PP,' which is a personal problem." "What can I do?" says David Ferrer after winning five games against Novak Djokovic. "He was better in every way." Li, 30, broke Sharapova three times to take the opening set, including in the first game, and then broke again in the fifth game of the second. The sixth seed, the first Asian player to win a Grand Slam crown, maintained her form to seal victory in only 93 minutes. "Every time I'm back in Australia, I always feel something here," said the 2011 French Open winner. "I always play well here. Everyone can be nervous in a final, so I have to enjoy it. I'm looking forward to it." Li, who appointed Argentine Carlos Rodriguez as her new coach last August, said her success was down to projecting a calmer face on court. "Maybe before I was angry or something. Start of this year, I try to cool down on the court," she said. "You don't have to show opponent what are you thinking. A little bit like Hollywood, but not real." Sharapova, a four-time Grand Slam winner, hit six double faults and made 32 errors in a poor display but was quick to praise Li. "I think she played a really great match," said the 25-year-old. "She was certainly much more aggressive than I was and dictating the play. "I was always on the defence. When I had my opportunities and break points in games that went to deuce, I don't think any of them really went my way today."